Supposedly, Possibilities portrays this couple’s relationship in reverse with every other scene offering a different possible route a friendship could take. However, without knowing this beforehand the framework of the play is almost impossible to decipher, and instead you find yourself focusing on each scene as an individual snapshot of the relationship, without needing to attach it to any particular time-frame or place it in relation to the preceding scenes. Chong’s characters are extremely likeable, even through their flaws, and the script is certainly full of relatable situations and smart insights into friendships and relationships alike. The majority of the dialogue is naturally and effectively composed, and the relationships and circumstances rarely border on cliché or risk being predictable or inconceivable, which is often the danger with plays of this nature. Chong and Gwynn also give very humble and balanced performances throughout, switching frequently from strangers to the intimacy of a couple years into a relationship. With just the turn of a back or the removal of a prop, the two drift fluently from one scene to another, even if that means an emotionally-demanding moment is immediately followed by a line of complete indifference. Possibilities is an enjoyable study on different aspects of relationships and interpersonal journeys, however it doesn’t necessarily engage the audience with its larger structure and framework in the way that is intended. The strength and success of the play lies within the smaller moments and details of day-to-day conversations, emotions and human interactions. 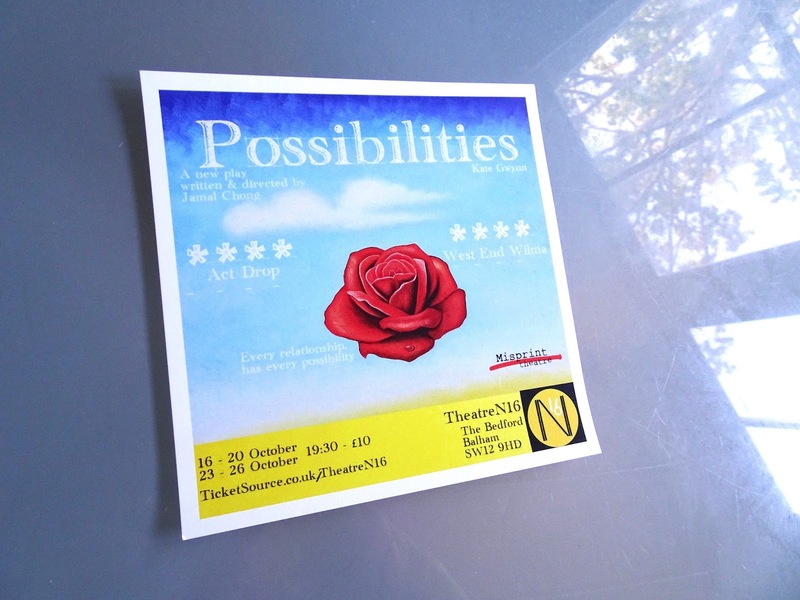 Possibilities is playing at Theatre N16 until 26th October. * I was gifted this ticket in exchange for review but all words and opinions are my own.